Jack Finnegan only has to worry about dealing with school bullies, suffering through detention with his homeroom teacher, and getting noticed by the girl of his dreams... at least until an army of evil aliens invade Earth. Suddenly, this teenage slacker finds himself at the center of a galaxy-spanning conflict - where the lives of everyone on the planet are in jeopardy, soldiers use Quantum Physics to become superheroes, and the enemy uses some mysterious form of magic to make themselves practically unstoppable. The secret to ending the conflict and saving the universe may lie in a powerful ancient spaceship, which it seems can only be flown by Earthmen. Now, Jack and a rag-tag group of allies must overcome impossible odds, defeat an unkillable enemy, rescue the princess of the galaxy, and save the universe from a threat more terrifying than any it has ever faced. Can this underachiever rise to the occasion and become the hero Earth needs? The fate of all life in the galaxy may rest in his hands. I really liked this fun sci-fi. It had planet busting alien ships, bullies, evil robots, heroes and a princess. I must admit I started this book with a groan. The introduction was a rather wordy 'historical' look back from the future and I wondered what I'd gotten myself into. Kids my daughter's age would be a great audience for this book but I know from experience she would have lost interest reading the introduction and put it down. But then the story started and my initial opinion was completely and humbly forgotten. Earthman Jack got ambitious and didn't let up. With each new challenge, Jack grew up a little more. Who would have thought mastering video games would one day save your life? Honestly, I don't think that anyone other than a fifteen year old Gamerbox master could have pulled this off. Surrounded by great sidekicks and bad guys who get plain worse every time you turn around, Jack faces every plot twist with more guts and humour than I thought possible. 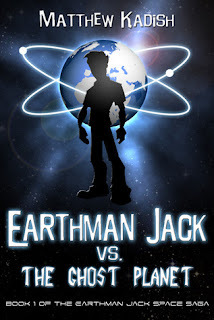 Earthman Jack vs the Ghost Planet is a fun and exciting for everyone galactic adventure. Like the car chase that doesn't let up, this one takes over and drives you along. I truly look forward to finding out what Kadish does with this amazing world (err, eight star systems) he's created.